One of the best tools for learning a subject is a puzzle. These wordsearch and crossword puzzles will help teach biblical facts. Please use them in teaching Sunday school for children, teenagers, and adults. A - Find the biblical names beginning with the letter "A". After Salvation - Find some of the things a person should do after they are saved. Around God's Throne - Find what can be found around God's throne in this wordsearch puzzle. Bad Guys and Rascals - Find many of the bad guys of the Bible. Bible Statistics - Do you know many of the basic statistics about the Bible? Birds of the Bible - Identify many of the birds found in the Bible in this wordsearch puzzle. 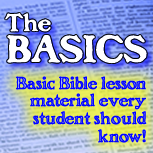 Building Materials - Find many different biblical building materials. Builders of Cities - This wordsearch contains many of the builders of biblical cities. Cities - Find many of the cities mentioned in the Bible. Christians - Complete this wordsearch and learn different biblical names for a Christian. Comforter, The - Complete this wordsearch to learn more about the Holy Spirit. Couples of the Bible - This wordsearch contains some of the couples found in the Bible. Couples II -- This wordsearch contains some of the couples found in the Bible. Covet Not - Identify some temptations that should not be coveted. Creation - Find many of the words having to do with the biblical creation. Daniel - Locate words having to do with the book of Daniel. Diseases & Infirmities Found in the Bible- Find many of the infirmities and diseases found in the Bible. Done by the Tongue -- This wordsearch highlights some of the damage an unbridled tongue can do. Dreamers - Find biblical characters that dreamed or had visions. Deuteronomy 6:5 - Complete this wordsearch puzzle that reinforces the learning of Deuteronomy 6:5. Early Churches - Locate many of the early churches identified in the New Testament. Enemies Israel Battled - Find the biblical enemies of Israel. Ephesians 2:8-9 - A wordsearch that helps teach Ephesians 2:8-9. Evangelists and Missionaries - In this wordsearch puzzle, find some of the Bible's missionaries and Evangelists. First Christmas, The - Complete this worsearch about the first Christmas. Food of the Bible - Find many of the foods found in the Bible. Genesis - Complete this wordsearch containing many of the people and events found in Genesis. Give God - In this wordsearch, find what we can give God. God Changed Their Lives! - In this wordsearch puzzle, find many from the Bible that God changed their lives! God Is ... - This wordsearch puzzle reinforces the many attributes of God. God's Character - Solve this wordsearch puzzle and learn the attributes of God's character. God's Grace - This wordsearch teaches God's grace as found in Titus 3:7. 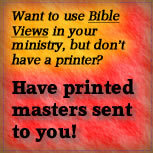 Hidden Books - Find, within the paragraph, hidden books of the Bible. Idols and False Religions of the Bible - In this wordsearch many of the false relgions and idols are hidden. Insects - Locate some of the many insects mentioned n the Bible. Jesus Ministered In ... - Find many of the cities in which Jesus ministered. Jobs - This wordsearch hides many of the occupations mentioned in the Bible. Jonah's Lesson - Solve this wordsearch having to deal with the lesson Jonah learned. Kings of Israel - Find the kings of biblical Israel. Leaders of The Bible - Find some biblical leaders in this wordsearch. Liars - Find some of the liars mentioned in the Bible. Matthew 6:34 - This wordsearch will reinforce the learning of a scripture about worrying. .
Measurements - Find many of the measurements of the Bible. Missionaries - This wordsearch contains many of the missionaries of the past. Missionaries and Evangelists - Find, in this wordsearch puzzle, many of the Bible's evangelists and missionaries. Monies of The Bible - Find the currencies of the Bible. Mountains of the Bible - Find the mountains of the Bible in this puzzle. Musick of the Bible - Locate those involved in music and instruments of the Bible. 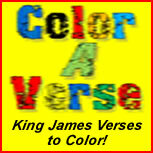 Names for Our Bible - Find biblical names for the Bible. Not of This World - Identify some of the things that are not from this world in this wordsearch. Older Than 900 Years -- This wordsearch puzzle lists biblical chararacters that were older than 900 years. Old Testament Books - Find the books of the Old Testament in this wordsearch puzzle. Old Testament Books - Complete this simple crossword puzzle containing books of the Old Testament. Parables - Locate many of the Bible's parables in this wordsearch. Paul's Travels - Find the places Paul's missionary journey led him. People of the Bible - Complete the wordsearch puzzle containing famous people of the Bible. Philippians 4:13 - Complete this wordsearch puzzle to reinforce the learning of Philippians 4:13. .
Plants - Find plants that are mentioned in the Bible. Prisoners - This puzzle lists biblical characters that spent time in prison. Proverbs 22:6 - Complete this wordsearch of Proverbs 22:6. Psalm 27:14 - This wordsearch puzzle reinforces the learning of Psalm 27:14. Queens of the Bible - Find many of the queens mentioned in the Bible. Rivers of the Bible - Locate the rivers of the Bible. Romans 6:23 - A wordsearch puzzle that helps teach Romans 6:23. Romans 10:9 - Complete this wordsearch to learn Romans 10:9. Rulers - Find the rulers of biblical times. Sin Changed Their Lives - Find many in the Bible whose lives were altered by sin. . Sins of the Flesh - Locate the sins of the flesh as found in Galatians 5:19-21. Sins in Romans I - Find the sins mentioned in Romans I.
Tabernacle - Find items found in the Old Testament tabernacle. 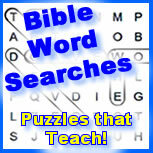 Teachers - This wordsearch lists many of the teachers mentioned in the Bible. Titles of Jesus - This wordsearch teaches the various titles attributed to Jesus. The First Christmas - This simple crossword teaches the first Christmas as told in Luke 2. The Prodigal Son - Solve this wordsearch pertaining to the Luke 15 account of the prodigal son. They Also Faced Trials & Tribulations - Complete this wordsearch identifying many biblical characters that faced trials and tribulations. . They Prayed - This wordsearch shows many that prayed in the Bible. To Whom We Owe Our Gratitude - Solve this wordsearch and remind yourself of the many we owe our gratitude to. Traitors - Locate many of the traitors found in the Bible. Trees - Find trees found in the Bible. Tribes of Israel - Find the tribes of Israel in this wordsearch. Virtues - This word search puzzle contains the virtues mentioned in II Peter 1. Waterways - Find waterways of the Bible. What a Christian Should Do ... - This wordsearch teaches many of what God commands a Christian to do. What Christians Have - This puzzle reminds us of the many things a Christian has. When the Wise Men Came ... - This wordsearch teaches about the wisemen when they came to see the young Christ child. Daily View, a New Testament devotional. Bottom Feeders or Trophy Catch? Aren't You Glad You Don't Get What You Deserve? Where Is the Word of God?